NEWS SCOPE AUTOMATION Besser technology nets operators real-time plant optimization Besser Co. and Pittsburgh-based cloud-com- puting specialist IQity Solutions LLC have announced Besser Connector, a technology platform to maximize efficiency and re- turns by enabling manufactured-concrete producers to proactively manage operations throughout a day's schedule. 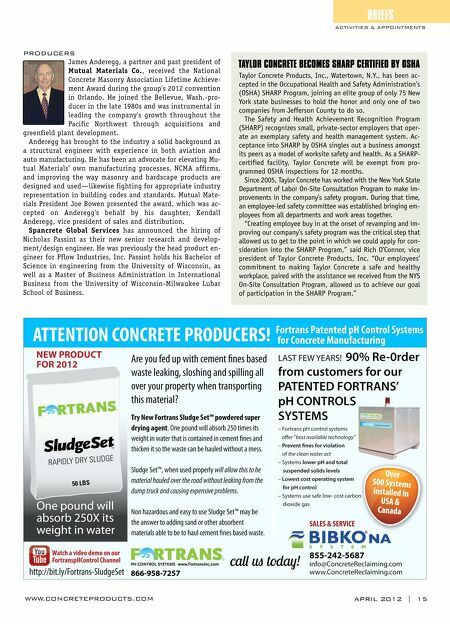 "Connector collects and unifies critical data from all plant work centers," says IQity Director of the Concrete Products Practice Kevin Duggan. "Data is instantly correlated into real-time visual pods of intelligence that inform the operations team about actual performance levels and the root causes of variation from ex- pected values. This visibility allows the producer to act immediately to positively influence the quality and throughput levels of the current shift." Besser Connector delivers intuitive vi- suals via IQity's flagship intelligence tool, IQ-Fusion, accessed via web browser. Its user-friendly graphics illus- trate where the most costly production mistakes—or the most profitable prac- tices—are happening. The real-time data empowers operators and managers to make immediate plant adjustments by focusing on the right things at the right time, Duggan contends. "The last several years have been brutal to our industry," says Besser CEO Kevin Cur- tis. "We found ourselves in survival mode, we realigned, refocused and are now oper- ating leaner than ever; the question be- came how do we help plants operate as smartly and profitably as they can. The an- swer came when [we] partnered with IQity Solutions on the Besser Connector." We're investing in the technology, adds Director of Sales John Reedy, "because we see the potential it has for improving the performance of new or existing plants, regardless of the brand of equip- ment operating. Simply by unifying all the data and processing it through the Connector, we reveal the most critical is- sues in the plant, so we can address what is and isn't getting done." Block, hard- scape, pipe and precast plant operators will benefit from Connector's capability to provide real-time visibility into the plant's performance, he adds, and in- stantly calculate the financial impact of each element of the production process. 14 | APRIL 2012 Besser Connector provides real-time visibility to critical elements of production operations, in user- selected, role-based views. Users can monitor up to six different metrics at once, allowing them to take the appropriate action at any given time, based on their areas of responsibility. This view shows what is happening in the first hour of a production shift, showing (from left to right, top row to bot- tom): Bin Aggregate Moisture, Water Batching Precision, Water-to-Cement Ratio, Production Output, Oil Temperature, and Product Density. In the time frame shown, the Bin Aggregate Moisture (top row, far left) began too high, as seen in the plotted points falling above the targeted range. Meanwhile, at the Production Machine (bottom row, center) the Oil Temperature was too low at the start, as seen by the plotted points falling below the targeted range. Both of these conditions, if not addressed, would result in a final product that does not meet required quality specs. So, with the real-time view to monitor the start of the shift, mixer operators cut back on water so the moisture came down into target range as the machine operator works to bring the oil tem- perature to specification. As the process variables came into control during this Connector-monitored cycle, product density met specifications, and the machine achieved target output. Besser Connector can pull data from any equipment, regardless of original equipment manufacturer (OEM). WWW.CONCRETEPRODUCTS.COM A sampling of views available for a specific product machine (from left to right, top row to bottom): Overall Equipment Effectiveness (OEE), Downtime, Water-to-Cement ratio, Production Output, Yield Loss, and a Statistical Process Analysis, which shows historic trending of Water-to-Cement ratio. Com- panies improving on multi-faceted metrics are more likely to improve financial performance. The Enterprise Dashboard allows executives to quickly compare regions and plants across a variety of consistent metrics, enabling a fair and accurate evaluation of business performance. 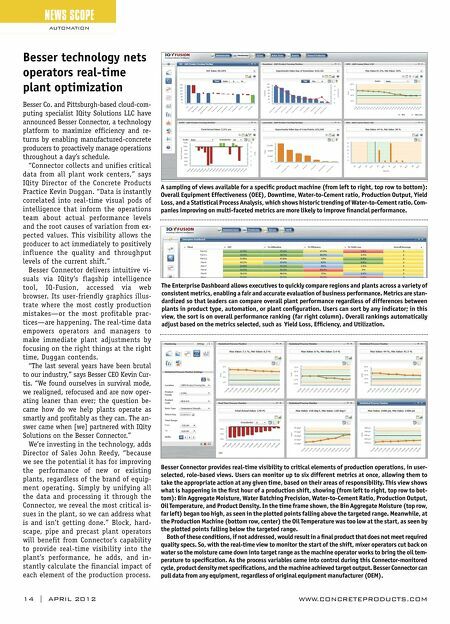 Metrics are stan- dardized so that leaders can compare overall plant performance regardless of differences between plants in product type, automation, or plant configuration. Users can sort by any indicator; in this view, the sort is on overall performance ranking (far right column). Overall rankings automatically adjust based on the metrics selected, such as Yield Loss, Efficiency, and Utilization.